We have a selection of brewing hops from all over the world, to grown your own beer. Hops from England, Germany and America and Australia. Hops is a climber. It can reach 10m high. It can also grow beyond 1m wide. We grow ours on a fence around the veggie garden. It grows all Summer up to 1m a week. 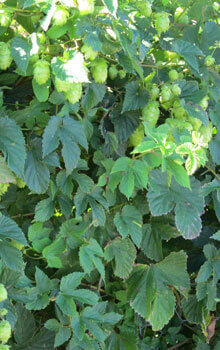 Large heads of white flowers that once pollinated become hops heads. They will be ready for picking in Autumn. Full sun to part shade. Need to be kept moist. 140mm Pot in spring/ summer, and as a Crown in autumn/ winter.